Dragon Hollow is a magical play land adjacent to A Carousel for Missoula in Missoula, Montana. The play land was the combined effort of artists and consultants from Leather's and Associates, Inc., a playground architectural in Ithaca, New York, and local play area experts--the students of many local grade schools. 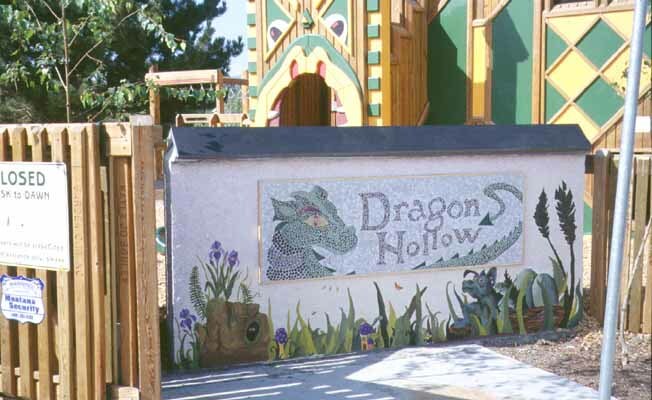 Robert Leathers drew the plans for Dragon Hollow after consultation with the kids in September of 2000. After nine months of revisions, organization and planning, community members gathered to begin the physical process of play area construction. To begin a three-day pre-build, over 150 holes were dug in a 6,000 square foot area, and poles were planted in each hole. By the end of the pre-build the enclosed structure, which was to become the Dragon's body, had begun to take shape. Three weeks later, more volunteers joined the first group and worked for six more days to complete the dragon, add swings, a special area just for very small children, a celebration pavilion, musical instruments, two 'telephones,' swings and a host of other delightful play things. 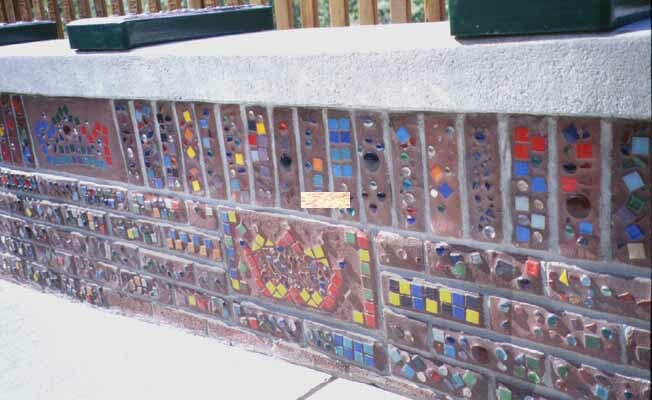 A tile wall with names of those who contributed food, labor and services, and a granite wall with names of major contributors thank just some of those who were so important to the creation of Dragon Hollow. The entire play area is surrounded by a fence made of pickets with names engraved into them, giving information about still others who were part of the process. On sunny days the air in Dragon Hollow rings with the sound of children's laughter. Even on very cold days a few brave souls venture into the play area. Enjoy another Missoula treasure created by a generous, creative community. Dragon Hollow is open to the public from dawn to dusk each day. There is no charge to use the play area. Dragon Hollow directions when approaching from I-90 east or west, take the Orange Street exit, turn south onto Orange Street at the bottom of the ramp, turn left on Broadway and right on Ryman Street. Following US 12 from the west/US 93 from the south, go straight on US 12 when the highways split. US 12 turns into Brooks Avenue and then into Higgins Avenue. After crossing the river, turn left on Main and left again on Ryman. Ryman leads directly into the Dragon Hollow/Carousel parking lot.